Nowadays, the binary options industry is assailed by dozens and hundreds of so called binary robots that promise you to become wealthy within days. This is why you should be with eyes open whenever you register a binary service of this kind. 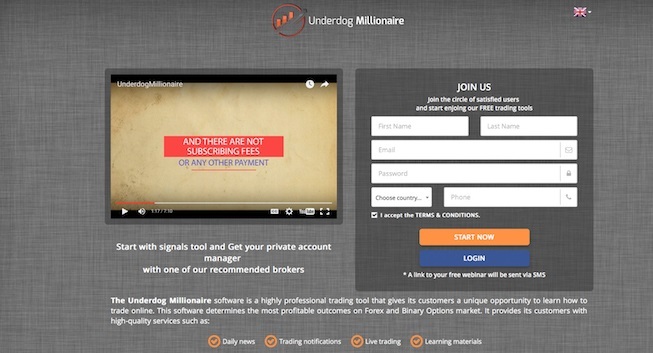 Underdog Millionaire is one of these recent binary auto-trading systems. It promises you a 95% winning rate, which is totally unrealistic. Can you really generate such a high profit and almost double your investment every time? We know it’s not doable, and we know that similar promises were made by scam robots, which is why we have decided to make a short review and expose this service to our readers. During our research, we could not find any evidence like positive comments or reviews. The service is not recognized by Google ranking as well, which shows how unreliable it may be. Since we don’t have enough details about this binary trading system, we would recommend our readers to be careful with it. On the sales page, you will find a presentational video that claims the creator of this binary system is Albert Friedemann, a German mathematician who is obsessed with trading algorithms. However, we could not find info that such a person is real and we saw the video had a paid voice over narrator. This can show the low quality of this service and we don’t think it’s reliable at all. The good news about Underdog Millionaire is that it does not have a price. A free system that can make you a millionaire – isn’t that your dream? Well, we know that productive systems cannot be free. In fact, Underdog Millionaire is linked with more brokers, which you can find on their list. When you choose your broker, you will have to make a minimum deposit, which is probably in the range of $250. How Does Underdog Millionaire Work? This binary options system uses pretty much the same methods: it analyzes the market trends and processes the information with the help of advanced algorithms. At least they say it’s advanced. All you have to do with this robot is to pick the currency pairs or the stocks you want to trade, and then the robot will notify you when is the right time to open positions. You can trade both manually or by using the auto-trading mode. If you choose the latter, then you can focus on your daily activities and the system will place trades by itself. Making the first steps with Underdog Millionaire is easy. You should register the service by filling in the blanks with your personal info, so that you could get a copy of the robot. Then, you can set the application, choose a broker from their list and make a deposit based on their stipulated requirements. That’s it! You’re ready to trade. If you are lucky and make some profits, then you can withdraw your money based on the conditions of the selected broker. The suspicious thing about Underdog Millionaire is that it does not mention any special features and it is quite vague when describing the technology behind. We don’t believe there is a system that may double your investment whenever you open a position, so we won’t recommend this binary robot to our readers. Final Conclusion: is Underdog Millionaire a scam? Our final verdict is that Underdog Millionaire is not a reliable binary options auto trading system, even if we could not find many details on the Internet. The positive comments and reviews are still missing, so we cannot encourage our visitors to deal with this robot. You should better look for more reliable binary systems at this time. Binary Minery review: Underdog Millionaire: 1 stars.